Pirin is the second highest mountain chain (firs is Rila) of the Balkan Peninsula, located in the west - southern part of Bulgaria, south of Rila. 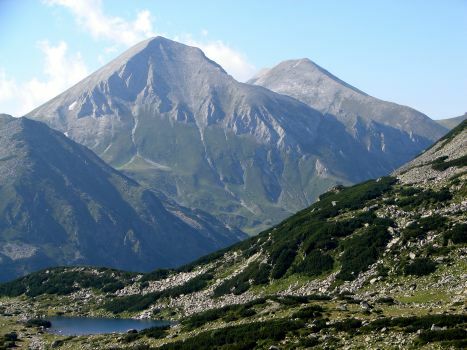 Pirin and Riła are separated by Rozłożka hollow and Predeł pass. 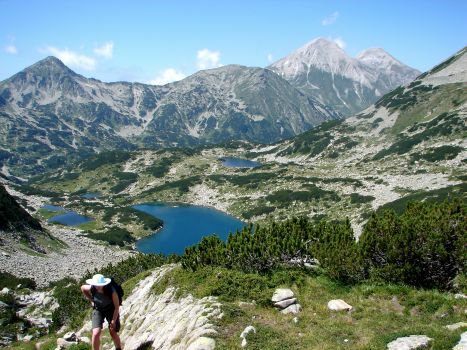 Generally, in contrast to the Rila, Pirin mountains are more rocky and sharp, but the climate is milder. You can feel here the clear influence of Mediterranean air masses (by the way, if you have a car, from Bansko to Kavala - the Greek port which is situated by the Aegean Sea, is approximately 160 km) - especially in the towns such as Bansko, Sandanski, Melnik. Of course, You must remember that in the high parts of the peak - just like in the mountains - you have to be prepared for all circumstances. 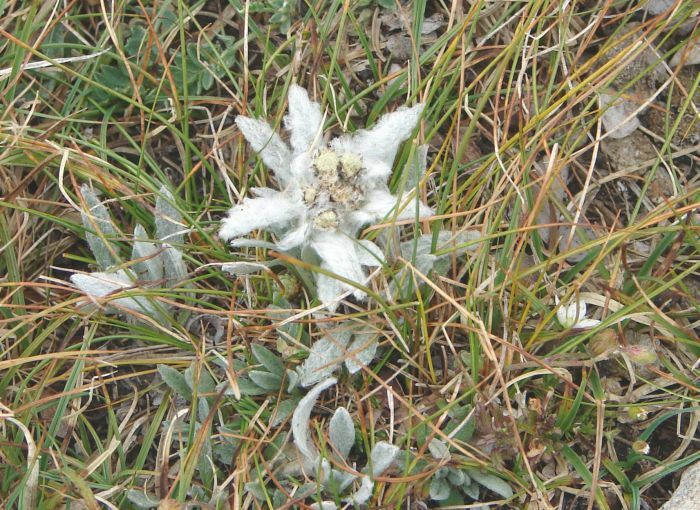 The symbol of the Pirin is an edelweiss (being under the protection). 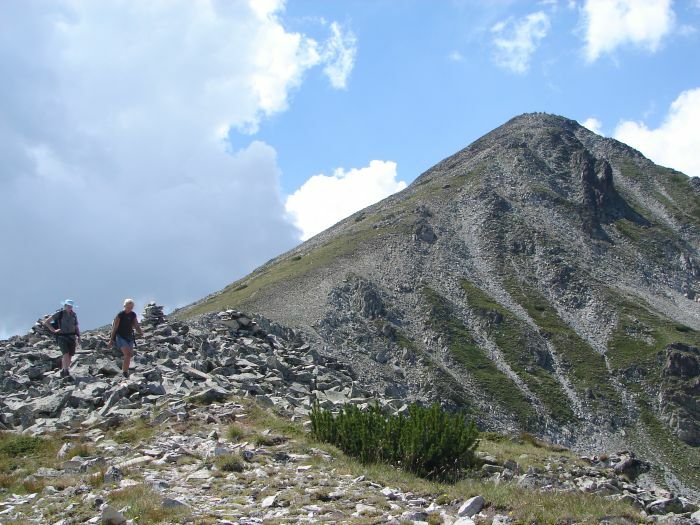 1st Wichren hostel (1950 meters AMSL) - Wichren peak (2914 meters AMSL) duration : approx. 4 hours (to and fro), (having good weather and good physical form :) ). / difficulty: middle, the distance is short, but with high variation in height Remark: I describe routes from the point which can be reached by car (passenger car, asphalt road). As I know, on the routes to the shelters: Goce Delchev and Wichren, run buses (but there are a few only, so being there You just have to ask). The route starts vis-a-vis the main entrance to the Wichren hostel. You have to follow the red marked route. 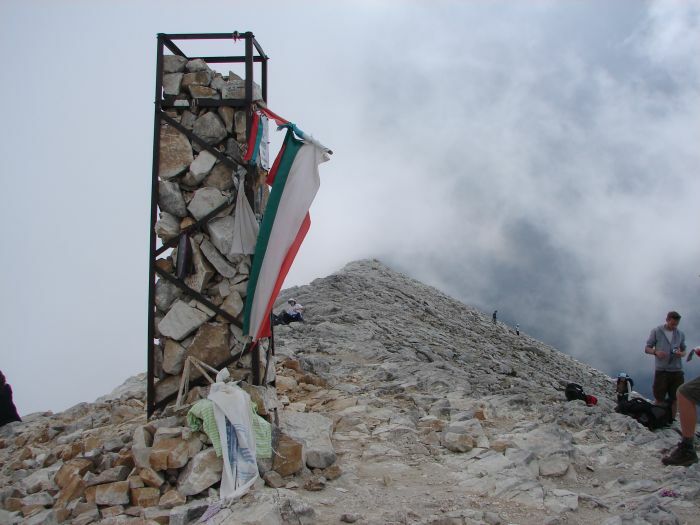 Your trip is relatively simple, because You can see 2914 meter high target all the time in front of You, but You have to sweat a bit. You have to remember to take water and cap on Your head and neck with yourself, especially in summer. 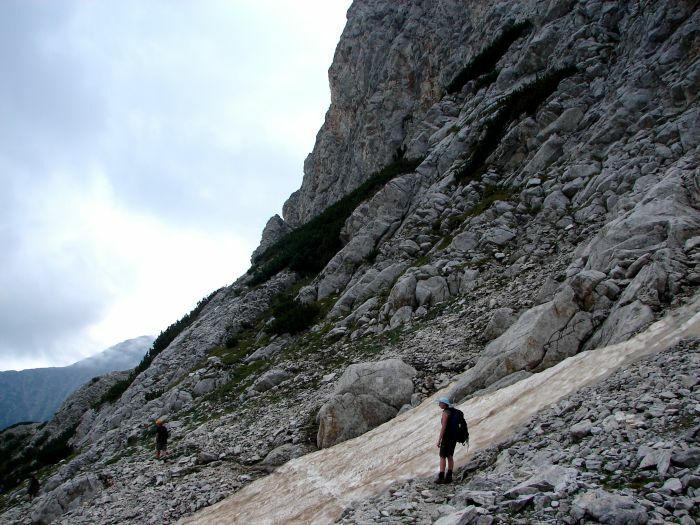 From the beginning, for about half of hour, the trail leads among the dwarf pines, and then by Pirin alp. 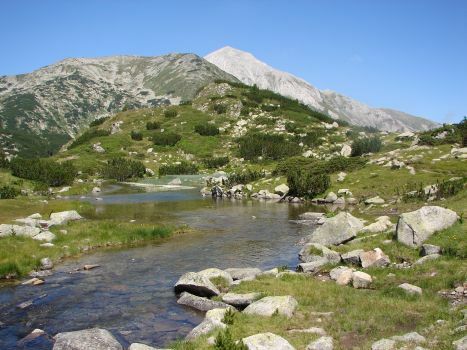 After about 1.45 hour we reach the Kabata pass, which separates the massif of Wichren from the massif of Chwojnaty Wrych. Here we finish the walking across the meadow and strat about 45 minutes climbing on the stony slope to the top (when it is dry, there are no technical difficulties, You can walk upright on two legs). 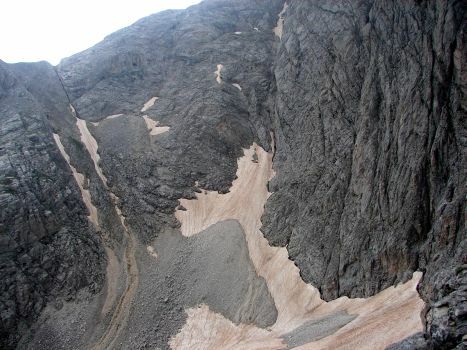 The Wichren peak is quite extensive. 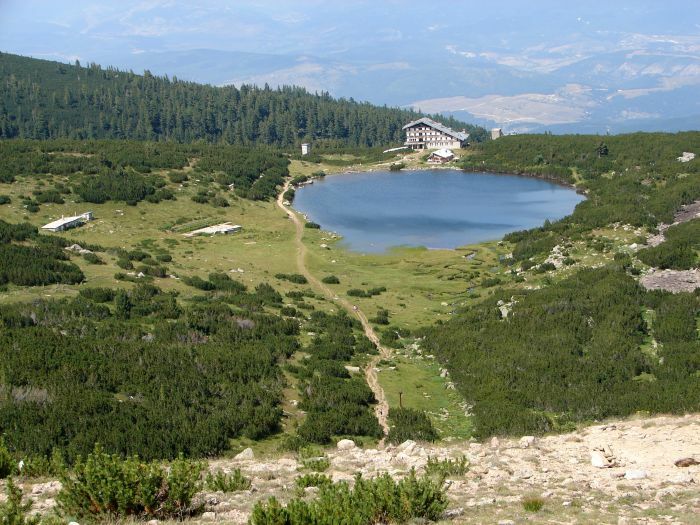 I have heard that there is an extensive and beautiful view from the top, on Kuteło, Bansko, Todorin Wrych, but I didn't see that because when we were there it was fog and nothing was visible. sinister looking slopes of Wichren. Near the Kazan shelter we have to follow the red signed route again. After about 1 hour we reach Wichren hostel. In the Wichren hostel You can order a delicious salad - Shopska - a very popular dish in Bulgaria. Its composition is very simple: tomatoes, cucumbers, onions, topped with grated sheep cheese, seasoned with salt, pepper, vinegar and olive oil - Bon appétit! so there is no risk that You get lost. I put a sketch on the map. Unfortunately, we don't do so called loop (I mean we have to hike there and back), but because of the magnificent views and quite low degree of difficulty I would recommend this option. The entrance to the chair-lift station from Gotse Delchev to Bezbog hostel costs 6 lewa (means about 2 EUR) in one direction. It is worth using chair-lift, because You will have more time at the top, and what's more, the climb is arduous and leads thorough forest (so we don't have views). In front of Bezbog hostel there is a lake with the same name as hostel. You have to walk round the lake on the right side and go in the direction of the pass. You must search a path leading into right,which should appear after about 20-30 minutes of hiking. 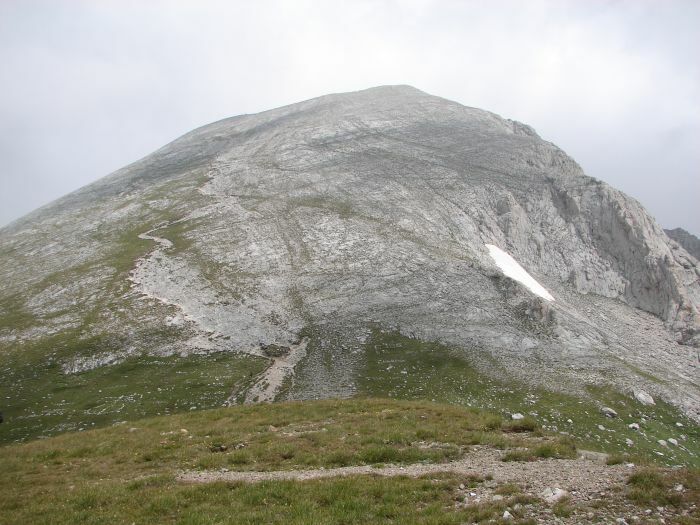 This path will bring You near Bezbog peak in about 0.30 hour. 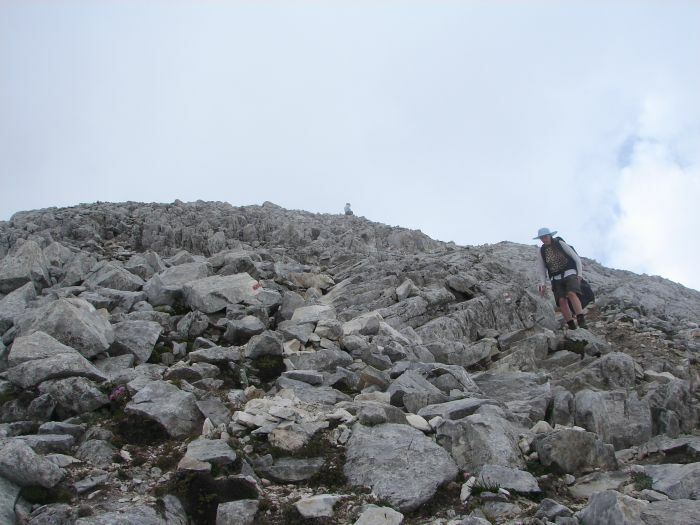 Climbing to the top is steep and rocky, but stones are stable and there is no exposure. You can rest a bit and after have to go back down to the meadow. Being on the meadow (alp), You have to choose path marked by small stone mounds. 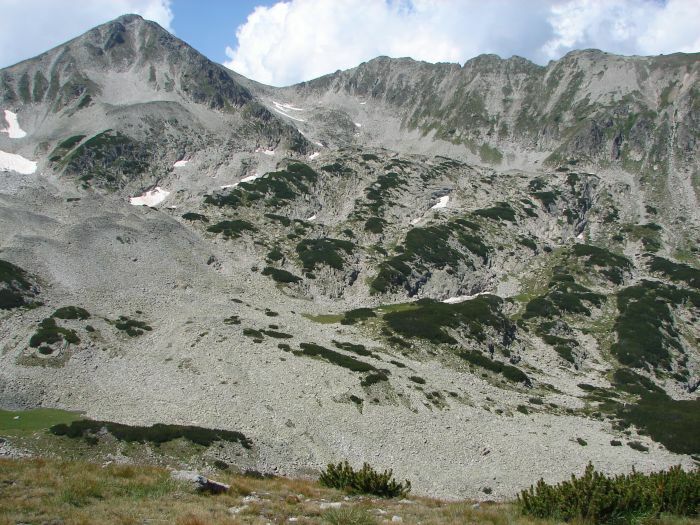 This path will take You to the Poleżan peak (2851 meters AMSL). If we walk with the whole packed rucksack, there is no necessity of coming back, You can hike straight, the path will bring You to the Demjanica hostel (I haven't been there). But our route leads back. From Poleżan to the Bezbog hostel is about 2 hours hiking. A chair-lift planned working hour is untill 16.00 but sometimes longer, depending on demand. We were in time and went down almost like "casual tourists". But because of that we had enough time to had a swim in thermal waters in the town Dobrinishte (By the way, a ticket to the pool after 17:30 p.m. to the end (20:00 p.m.) costs only 3,50 lew what means almost 2 EUR). You have to take into consideration, that above option is possible only for tourists with car or hitch-hikers. Public bus transport between Gotse Delchev and Dobrinishte is very poor, and You have to make sure about timetible. 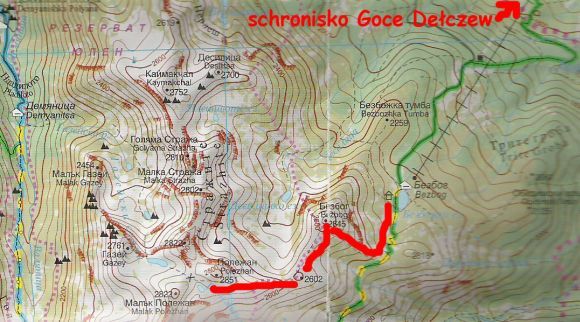 I'll skip the description of getting there, because it is almost the same as already written in case of Rila mountains. 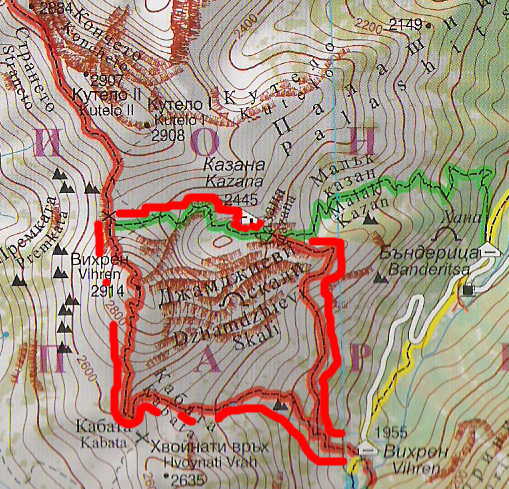 The same like in case of Rila, You have to go to Sofia. 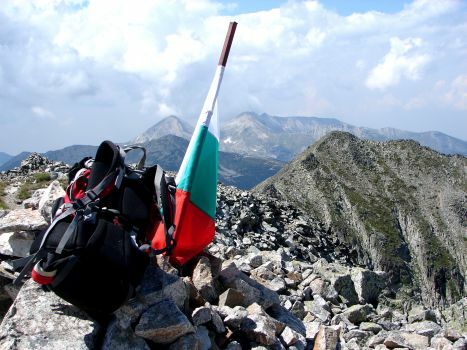 From Sofia You can go to any chosen town (Pirin is more protruding to the south than Rila, so, for example, from Sofia to Rila is 50 km, and to Pirin approximately 150 km). However, I can't advise anything, because I do not know how the direct access from Sofia to Pirin looks like (we were going from the Rilski monastery to Blagoevgrad, and then to Bansko). I checked, that there are buses from main bus station (it is close to the railway station) in Sofia to Bansko. The exact timetable You can find on the official bus station website: http://www.centralnaavtogara.bg . 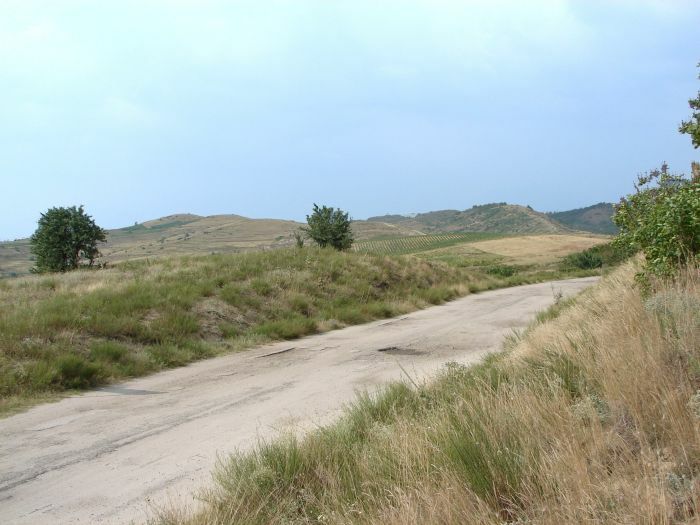 Information for tourists traveling by car - Bulgarian main roads are rather good quality. Local roads - not necessairly... We took a shortcut to Melnik and we came across a road rather for donkeys but not for cars (You can see it in the picture). This is the town with a population of 10 thousand residents, which is an important tourist centre in Bulgaria. 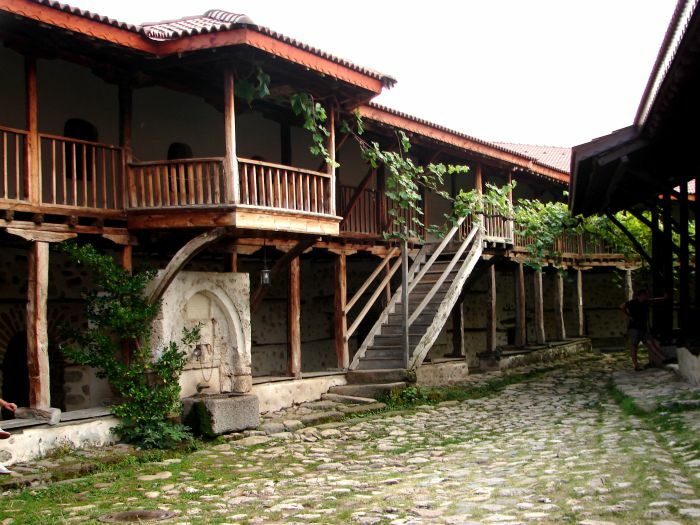 It is divided into two parts: old Bansko with plenty of turists and town residents and tourist complex, which clearly shows overinvestment. Many of the buildings are empty, and they are for sale. Due to the large number of hotels, finding accommodation is not a problem. However, You have to take into consideration, that hotels 3-4-stars are quite expensive. It is better to look for two-star hostel. We found an excellent and affordable accommodation (10 lewa per person, means about 5 Eur, double room with bathroom, TV, balcony). 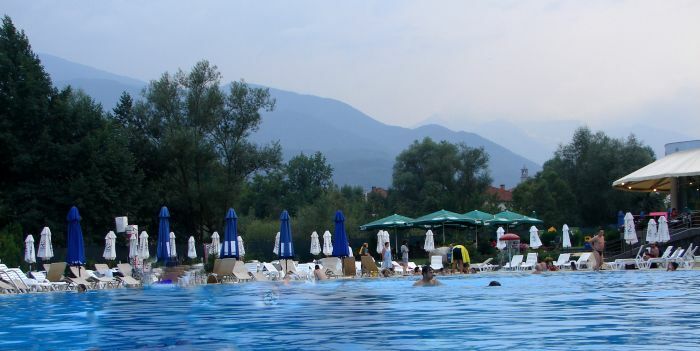 To get there, You have to follow main promenade in the direction of Pirin hotel, in front of the hotel turn right, after around 70 meters, You have to look for on the right building with two stars on it - I really recommend. 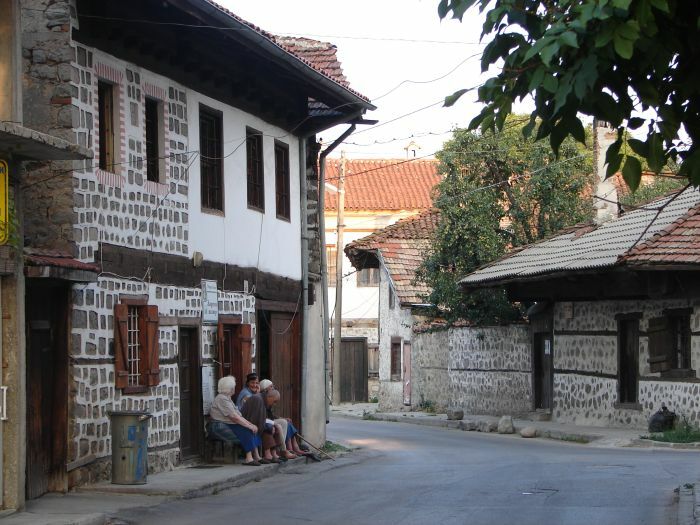 The old part of Bansko is a charming place for the romantic walks. You'll find here a number of pubs offering Bulgarian cuisine. What is more, the prices are relatively low, for example, beer on the main street costs less than 1 Eur (1,40 lewa), and you can eat a good lunch for about 4 Eur (7 lewa). A characteristic view on the streets are an elderly women sitting on a benches on the street in front of their houses. The town also offers cultural entertainment: Museum of Icons, Museum of Neofit Rilski, Museum of Nikola Wapcarow (Communist poet, with a relatively poor work, one collection of poems called "Motorni Pesni" was issued, but in 1952 He was posthumously awarded the International Prize of Peace ... of course, in Moscow). Melnik is a unique town, situated near the slops of Pirin, surrounded by sandstone rocks. There is less than 300 permanent inhabitants.
. However, it was not always so. "Until the Balkan wars of the early twentieth century, the town remained in the borders of Turkey and was a big, important center - had a population of about 3,000 houses and 12 thousand inhabitants. Both the Balkan wars, the World War I and the post-war arrangements led the town up to ruin. A lot of vineyards has been destroyed then, later, as a result of international agreements, a significant proportion of the population (Turks and Greeks) have been displaced. As a result of these disasters and transfer the administration to Sandanski Melnik declined. "- Bulgaria Guide, R. Sendek, ed. Bezdroża 2009. 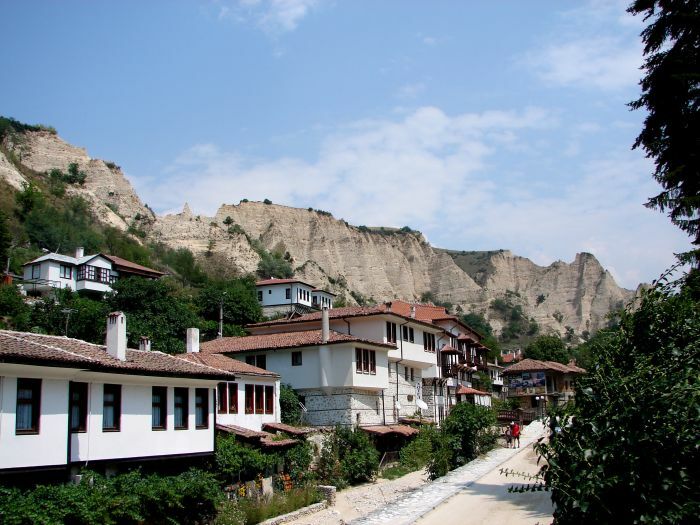 Currently, Melnik is a charming tourist town. There is no problem with finding accommodation in private houses in the price 10-30 lewa (5 - 15 Eur). Main attractions of Melnik are: situated 6 km from the town Monastir Rożeński and wine-bars. 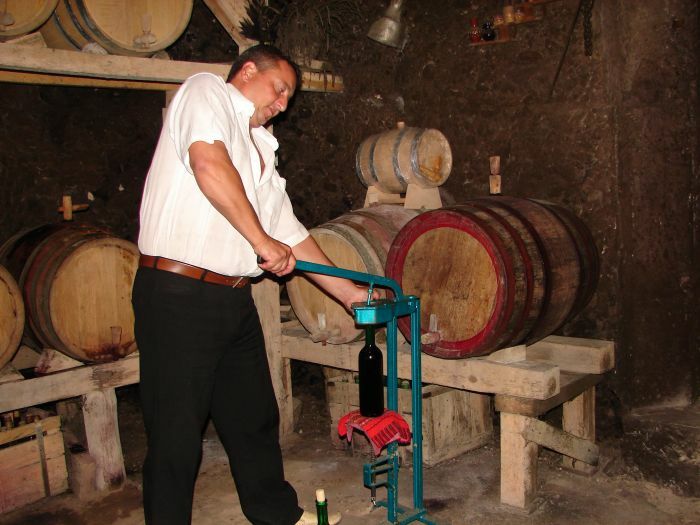 It should be noted, that Melnik is famous for its red wine of the same name (Melnik), produced from melnik vine. Almost everyone in here is making it, so you can buy a cheap home-made wine. There are also professional wine bars, which offer wine for tasting and buying (also vintage wine).